Spectacular new Beachfront condo, approx 2300 sq ft, 3 bedroom, 3 1/2 bath, corner penthouse with incredible ocean view There is an inside stairway to a large, private, rooftop deck with covered and fanned dining, lounging and BBQ area. The infinity edge pool is the only thing between you and the ocean. The home is located in Playa Langosta, the most exclusive residential area and beach in Tamarindo. This home is truly elegantly furnished with a large master suite that includes a bathtub and separate shower and dressing area with spectacular ocean views. The second and 3rd bedroom suites have 2 twin beds that are purpose built to be put together as comfortable kings. The choice is yours. There is a fully equipped kitchen, dining room, living room with large outside terrace in addition to the rooftop deck for dining and lounging. There are very few homes in the area that can come close to matching the ocean views. Other features include a large flat screen TV in the great room and a second one in the Master bedroom suite. The is high-speed Wi-Fi in the penthouse itself. There is also a full laundry room in the home. 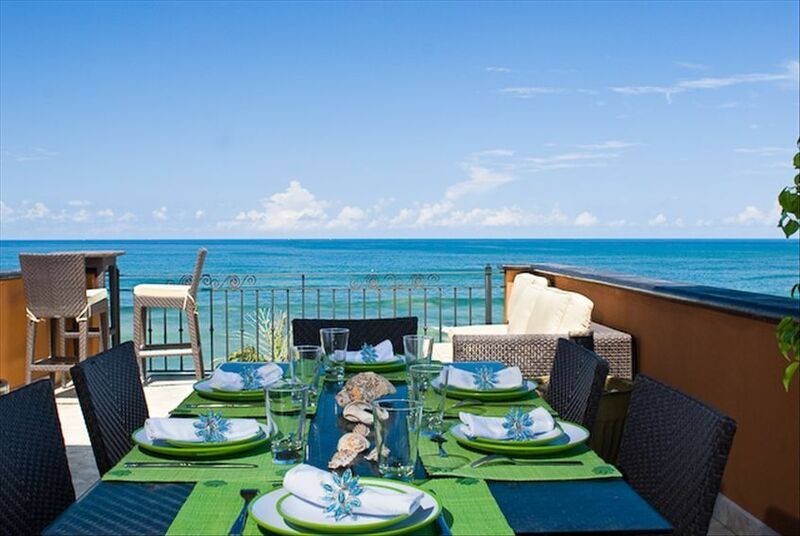 Pura Vida Luxury Rentals provides complete concierge service prior and during your stay. One of the most spectacular ocean and sunset views in the area. Excellent layout. Excellent location. Excellent service. The location, property layout, and management company service were awesome! The property does need a little more tidying up and could use some repairs. With this said, I would stay here again in a second. The surf check views and sunsets could not have been better! This property is shown as being in the middle of Tamarindo, but it is not at all. The property is a ways away and from here the only way to safely get to Tamarindo is in a car or golf cart (but even that is a bit of a drive). I was only given the correct location after I booked, but at that point the owner/manager said that I could not have a refund. So far, VRBO has done nothing to help recoup my money despite showing that they have a 100% guarantee against misrepresented listings. This review is not about the quality of the property. It may be a nice place to stay if you don't mind not being in the heart of Tamarindo, but I did not even stay here because it was too far away from where I wanted to stay. Not once in my stay did I even come within a mile of this property. Make sure you know where it is, because the owner/manager refused to refund my deposit, despite knowing the property is misrepresented. Loved it. Condo was everything it promised. Beautiful condo with great views! The condo was beautifully appointed, comfortable with beach access. enjoyed spending time on the two decks, one was on the rooftop. Great location—right off the beach and walking distance from town. Horizantes del mar was the perfect location for our family of seven to spend a week unwinding. Pura vida rentals provided the ultimate concierge service to accommodate every request we had: from arranging transportation, to surf lessons, atv tours, local meals prepared in the condo, and they even drove us to the grocery store. An added perk was they provided is a local cell phone to use so that we could contact them as needed or call local restaurants and taxis. The condo was in a perfect location. You walk out and turn left and have your own private estuary to swim in. It was truly unspoiled beauty. Each night, the sunsets from the rooftop were breathtaking. It was about a 15 minute walk along the beach into town or a $6 taxi ride. The condo itself was spacious enough for the 7 of us to spread out and have plenty of room. The rooftop patio truly sets this property apart. Aside from the amazing property, pura vida rentals was the best to work with. We spent a few days in the rain forest before coming to their property and they were willing to coordinate all of our transportation from the airport , to the rainforest, to the beach , and back to the airport. We had a family issue and needed a last minute airport trip from the rainforest and they accommodated that too. All the service providers that they connected us with were top notch and reasonably priced. We will definitely be back and working with bob Wilson and his team at pura vida rentals. Great Digs 7/22-7/30 Rainy season NOt!! DID NOT RAIN A DROP SUNSHINE!! SUNSHINE!! the whole week. WE had myself and 5 ladies from ages 14-19. The condo was wonderful. Plenty of room for everybody. Great location ,oceanfront, nice upper balcony with an awesome view of ocean and sunsets. Nice beach right out front with wonderful snorkeling( lots of fish to see). Easy walk to town or a 5$ cab ride. Strong wifi ( girls loved that at night to stay connected lol). Kitchen equipped with everything. We only did breakfast and lunches. Ate out alot. Great pizza place accross the street with a Quick mart store there also. Juanro and Stefano were awesome in getting our excursions lined up. We did whitewater rafting, waterfalls,zip lining,horseback riding, snorkeling,surfing and Stand up paddle boarding. Also did a day of offshore fishing catching very nice grouper and pulled off a couple of sailfish. Our time flew by but the girls had a wonderful before heading back to school and college. Daddy was worn out . Would stay there again in a minute. Thanks Again guys! CANCELLATIONS – A Ninety (90) day notice is required for cancellation. Cancellations that are made more than ninety (90) days prior to the arrival date will incur no penalty. Cancellations or changes that result in a shortened stay, that are made within 90 days of the arrival date, forfeit the full advance payment. Cancellation or early departure does not warrant any refund of rent or deposit. Any funds forfeited will be applied to a future visit. Christmas, New Year's and Easter payments are not refundable but will be credited toward a future visit.